My family is full of real outdoorsmen. They hunt, fish, hike, etc.., whatever keeps them outdoors. So, whenever I have the chance to try out products that go along with the activities they're involved with they get so excited, like little kids at Christmas. They are more than happy to give their opinions on these "men" products. Women can sure use these products too. The 2 I want to tell you about today are Extreme Pak Invisible Camo Water-Resistant Waist Bag and Pro For Sho 34dB Noise Cancelling Shooting Ear Muffs. 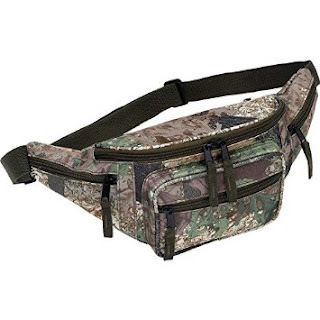 The Camo Waist Bag is so roomy and convenient to wear. There are several zippered pouches to keep thing separate but within arm's reach. My son loves it! He said that no matter how much stuff he's carrying in it, there's still more room. Now they can carry snacks, first aid, whatever. The waist straps are adjustable to fit just about anyone, and once it's fastened it stays securely in place. No slipping or sliding. The camo material blends in perfectly with all their camo clothes too. This waist bag is washable too but I like to let it air dry. Comes out as good as new. The Pro For Sho 34 dB Noise Cancelling Shooting Ear Muffs are very light weight, and well padded. They fit snuggly but aren't too tight. 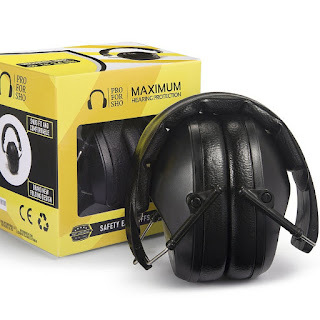 The padding in the ear muffs is very thick and the hole inside to acommodate your ear is large enough for your entire ear to fit in it and the padding forms a good seal to block out all loud noises. My guys in the family do a lot of shooting, whether it's target shooting or hunting and it's good to have hearing protection. This is a really good product.